MANILA- A woman supposedly carried the bomb that killed at least 21 people in a church in Jolo, Sulu last Sunday, the military said Tuesday. Two wounded victims revealed that a woman hid the bomb in a bag and left it in one of the pews inside the cathedral, the military said. It was after the woman left the bag that the explosion happened, Armed Forces of the Philippines Public Affairs chief Col. Noel Detoyato said. “Ang method of deployment ng IED (improvised explosive device), iniwan yung bag, then babae, and then it was remotely detonated so that will dispel report na may suicide bombing,” Detoyato said. Earlier, the military released surveillance footage of a man, supposedly Alias Kamah, brother of slain bandit leader Surakah Ingog, triggering the explosive device. 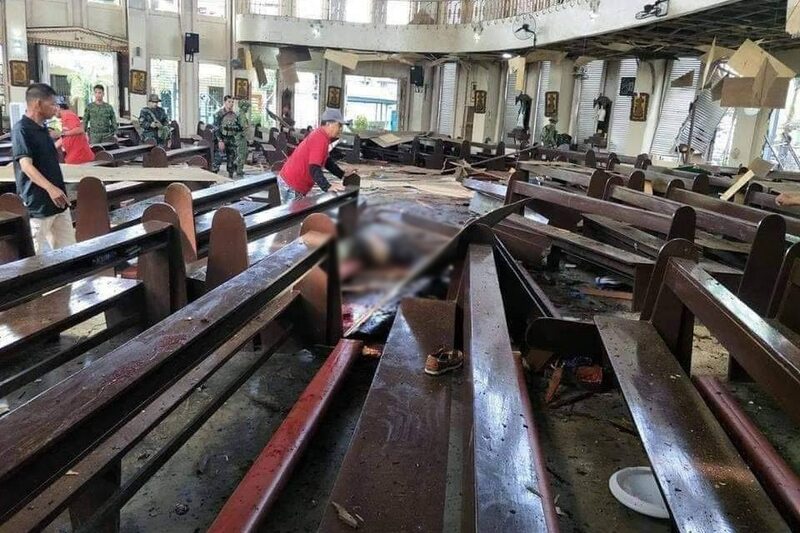 Kamah, a known bomb maker, ran away from the church and out of the video's frame with several cohorts, moments after the explosion, said Col. Gerry Besana, spokesperson of the military's Western Mindanao Command. Detoyato, however, noted that the witnesses could not fully describe the woman's physical features. Sunday's double bomb attack left at least 21 people dead and over 100 others injured. The military is eyeing local terror group Abu Sayyaf as the perpetrator even as the Islamic State claimed responsibility for the attack. Detoyato alleged that a subgroup of Abu Sayyaf called "Ajang Ajang" carried the attack. The group is reportedly composed of young adults who were also residents of Jolo.